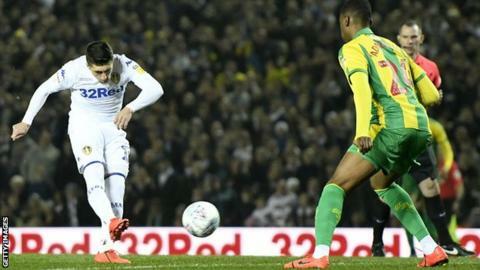 Pablo Hernandez scored after just 16 seconds as Leeds put in a relentless display to beat promotion rivals West Bromwich Albion and go top of the Championship. From the away side's kick-off, Leeds won possession and fed the Spaniard, who was given time to pick his spot in the top corner from almost 25 yards. The hosts doubled their lead when Patrick Bamford showed composure to slot past Sam Johnstone after a through ball from former Albion forward Tyler Roberts. Hal-Robson Kanu headed over as the Baggies started the second half strongly but Bamford's deflected second and Ezgjan Alioski's tap-in made the score more emphatic for Leeds. Marcelo Bielsa's side move a point clear of Norwich - who go to Millwall on Saturday - with West Brom staying fourth, a further six points back. A surprise defeat for Leeds at QPR on Tuesday - a fifth in 10 Championship games - had sparked suggestions they were running out of steam in the promotion race. But an unchanged side showed energy and intensity from the first whistle at Elland Road, ex-Swansea forward Hernandez punishing Tosin Adarabioyo for failing to close him down quickly enough. Darren Moore's visitors had won eight of their previous nine away Championship games but managed just one shot on target, and have now lost successive games against promotion contenders following a home defeat by Sheffield United last weekend. The impressive Roberts set up Bamford for both of his goals, the second flicking in off Albion defender Craig Dawson, with Alioski showing stamina to get forward from left-back to roll in a fourth in stoppage time. It also bettered West Brom's 4-1 victory in the reverse fixture at The Hawthorns in November, which at the time stopped Leeds moving top of the table. "For me the most important thing was the effort, attitude and state of mind of the whole team during the whole game. "When a win is based on such a consistent effort from the whole team, we have to say that this is the responsibility of the players. "I don't want to make excessive comments. When you win a game by a big difference it's better to be moderate in your analysis." "We were caught cold with the early goal and that gave us a mountain to climb. It gave them more impetus and momentum in the game. "We got more about it in the second half and I thought the next goal was always going to be the important one. It went to them and at 3-0 it's a really tough ask then. "I always want a performance and we didn't get a performance. "We're a close-knit group and we will stay together. We're all big characters, we've shown great team spirit to get to where we are now, and that will never elude us. We'll do it together. We win and lose games as a team." Match ends, Leeds United 4, West Bromwich Albion 0. Second Half ends, Leeds United 4, West Bromwich Albion 0. Goal! Leeds United 4, West Bromwich Albion 0. Ezgjan Alioski (Leeds United) left footed shot from very close range to the bottom left corner. Assisted by Jamie Shackleton. Substitution, Leeds United. Jamie Shackleton replaces Tyler Roberts. Attempt missed. Mateusz Klich (Leeds United) right footed shot from outside the box is high and wide to the right. Assisted by Stuart Dallas. Corner, West Bromwich Albion. Conceded by Pontus Jansson. Hand ball by Sam Field (West Bromwich Albion). Attempt saved. Mateusz Klich (Leeds United) right footed shot from outside the box is saved in the top right corner. Assisted by Patrick Bamford. Delay in match Mason Holgate (West Bromwich Albion) because of an injury. Foul by Jefferson Montero (West Bromwich Albion). Attempt saved. Ezgjan Alioski (Leeds United) left footed shot from outside the box is saved in the bottom left corner. Assisted by Tyler Roberts. Substitution, West Bromwich Albion. Jefferson Montero replaces Hal Robson-Kanu. Substitution, West Bromwich Albion. Sam Field replaces Rekeem Harper because of an injury. Goal! Leeds United 3, West Bromwich Albion 0. Patrick Bamford (Leeds United) left footed shot from the left side of the box to the bottom left corner. Assisted by Tyler Roberts following a fast break. Substitution, West Bromwich Albion. James Morrison replaces Gareth Barry. Corner, Leeds United. Conceded by Gareth Barry.